The Trilogy 907 Phono Stage has been meticulously designed to be the perfect interface between your turntable and high resolution amplifier. It is easy to overlook what mature technologies can still offer amidst all the clamour of the digital revolution. Vinyl's appeal as a medium of the highest quality still rightfully endures, despite today's convenience-led music market. 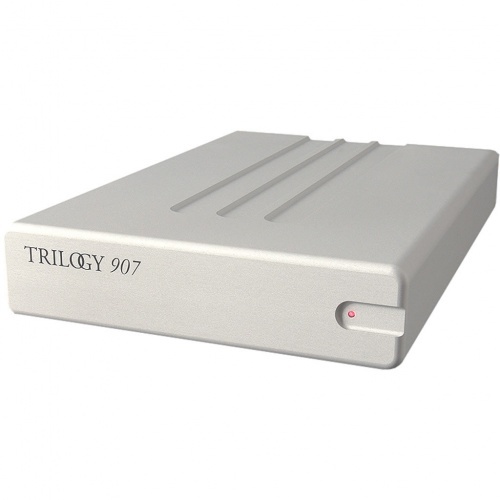 The Trilogy 907 Phono Stage has been meticulously designed to be the perfect interface between your turntable and high resolution amplifier. The compact enclosure for the active circuitry is machined from a solid billet of aluminium. It's 1.5kg mass provides outstanding physical and electrical isolation for each of the circuit elements. Even the DC from the power supply runs through its own channel within the housing, until L-C filtering takes place before the main power regulators. The commonly used series regulator, usually chosen for its lower power dissipation and simplicity, has been rejected in favour of discrete shunt regulators. They are biased heavily into Class A with plenty of voltage headroom to provide ample current for the active gain stages. The key feature of shunt regulators is their ability to sink, as well as source current. 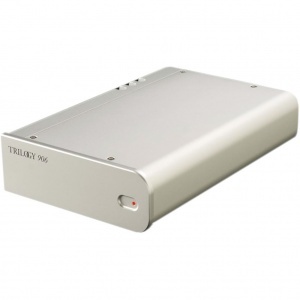 This gives a clear performance advantage under the dynamic operating conditions music demands. The DC for the regulators is derived from a new improved remote power supply. This can be placed remotely to keep any magnetic fields well away from the sensitive active circuitry. The custom mains transformer is designed with a low operating current density and a copper faraday screen. It feeds the main Mundorf reservoir capacitors through a bespoke inductor, forming a true choke input supply for absolute minimum electrical noise. The enclosure is non magnetic high quality aluminium with a thick brushed black anodised front panel. Each channel has its independently housed and isolated gain stage. The fully discrete topology is single ended; achieving high bandwidth and low distortion through the use of active current sources and cascode gain blocks, eliminating cross over distortion. Precision matched input transistor pairs ensure low noise. The circuit performance is such that global feedback is not needed. RIAA equalisation is passive, carefully optimized with precision components. Gain settings for MM or MC and cartridge loading are easily achieved via configuration switches on the base. Three gain settings and a very wide range of loading options mean virtually any cartridge can be accomodated. Bringing all the design elements together: innovative circuit topology, optimized electrical screening, superior component quality and elimination of microphony through mass loading, the Trilogy 907 achieves class leading performance. Vast headroom, low noise floor and low dynamic distortion are just some of the benefits that have been realized in achieving our main goal; outstanding musicality. 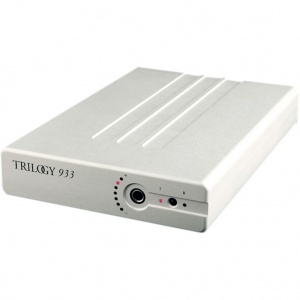 Superbly crafted for making music at the highest level, the Trilogy 907 conjures music that lives and breathes, keeping the magical essence of vinyl perfectly intact. Available in natural silver as standard. Extra cost finish options are our standard paint finishes, and almost unlimited custom colours through our Chameleon System. The 907 is proof that it can be all too easy to overlook what mature technologies can still offer amidst all the clamour of the digital revolution. Vinyl’s appeal as a medium of the highest quality still rightfully endures, despite today’s convenience led music market. 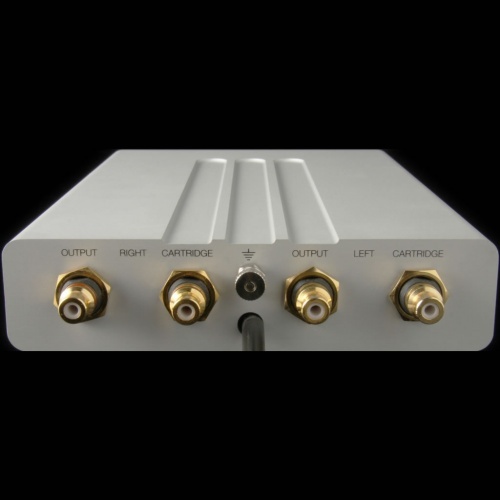 Get ready to experience the perfect interface between your turntable and high resolution amplifier. The compact enclosure for the active circuitry is machined from a beautiful solid billet of ‘natural bead blasted’ anodised aluminium. Its 1.5kg mass provides outstanding physical and electrical isolation for each of the circuit elements. Even the DC from the power supply runs through its own channel within the housing, until L-C fi ltering takes place before the main power regulators. The commonly used series regulators, usually chosen for their lower power dissipation and simplicity, have been rejected in favour of discrete shunt regulators. These are biased heavily into Class A with plenty of voltage headroom to provide ample current for the active gain stages. The key feature of shunt regulators are not only their ability to source current but to absorb current. This gives a clear performance advantage under the dynamic operating conditions that music demands. The DC for the regulators is derived from a separate power supply housed in a brushed stainless steel enclosure. This can be placed remotely to keep any magnetic fields well away from the sensitive active circuitry. The custom mains transformer is designed with a low operating current density and a copper faraday screen. It feeds the main Mundorf reservoir capacitors through a bespoke inductor, forming a true choke input supply for absolute minimum electrical noise. Each channel has its independently housed and isolated gain stage. The fully discrete topology is single ended; achieving high bandwidth and low distortion through the use of active current sources and cascode gain blocks. Precision matched input transistor pairs ensure low noise. The circuit performance is such that global feedback is not required. RIAA equalisation is completely passive and carefully optimised with precision selected components. The rear carries switches for MM or MC cartridges and cartridge loading. Optimum matching is easily achieved through 12 combinations of resistance and 4 of capacitance. A picture can say a thousand words, but no image can show you just how high the quality achieved on every trilogy product is. The finish really is strikingly beautiful, sumptuous, deep and if looked after with care, will last a lifetime. 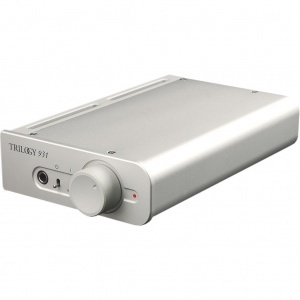 Superbly crafted for making music at the highest level, the Trilogy 907 Phono Stage conjures up music that lives and breathes, keeping the magical essence of analogue perfectly intact... as it should be. For those who want the most from their turntable and cherished vinyl collection, the 907 is an essential purchase. Single solid aluminium billet construction for mechanical integrity and thermal stability, with over 1.5Kg of remaining mass. Separate milled compartments for all three circuit boards. 1.5mm thick stainless steel base. Further on board inductor-capacitor filtration of external DC supply. Two pure Class A shunt regulators are fed from constant current sources. Massive 15A transistors are used in the power supply shunt regulators and are mounted directly to chassis to reduce signal induced microphony. High voltage headroom for superior regulator operation. Passive RIAA equalisation with precision polystyrene capacitors. Two identical mono gain cards. Highly biased, single ended discrete circuitry throughout the gain stages. Gain stages employ cascoding and constant current sinks to insure very high linearity and low distortion. High overload margins on all gain settings. Ultra low noises precision matched input devises. Externally switchable gain settings for Moving Magnet, high and low output Moving Coil cartridges. Externally switchable cartridge loading for resistance and capacitance. Very low temperature co efficient precision metal fi lm resistors used in critical locations. DC servo employed for very low output offset voltage. The standard finish of the 907 is an exquisitely beautiful ‘natural bead blasted anodised aluminium’. Also available is a ‘black bead blasted’ finish at additional cost. Choke input power supply circuitry. Non magnetic stainless steel construction. Ultra low fl ux bespoke toroidal mains transformer with copper Faraday screen.